Does what we consume define who we are? Harry Wallop takes a fresh look at society and shows you to your place in today's modern consumer world. Are you an Asda Mum, Wood Burning Stover or Sun Skittler? Do you know a Portland Privateer or Rockabilly? And exactly who are the Hyphen-Leighs? 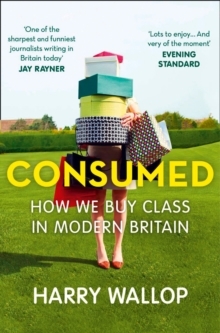 Journalist Harry Wallop has spent a disproportionate amount of his working life chronicling the buying habits of the British people. Taking a sweep through the seismic changes that have happened in the UK since the end of food rationing in 1954, he argues that our social standing in today's society is no longer determined by the accent you speak with, the school you attended, or your parents. Rather, it is determined by the food we eat, our choice of holiday destination, the clothes we wear, the size of the TV we sit in front of, and whether you use a plug-in air freshener or a smelly candle. He shows us how retailers and big business are making the most of how we fit into these new social categories, and offers up some intriguing insights into the state of Britain today.